Height (19mm) x Inside Dia (7mm) Holds - 110Kg 25 meters per coil Zinc Plated General Purpose St.. 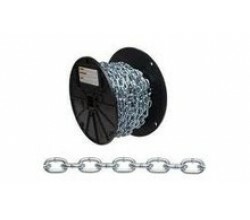 Height (23mm) x Inside Dia (9.5mm) Holds - 300Kg 40 meters per coil Zinc Plated General Purpose .. Height (29mm) x Inside Dia (11mm) Holds - 360Kg 25 meters per coil Zinc Plated General Purpose S.. Height (32mm) x Inside Dia (13.5mm) Holds - 600Kg 25 meters per coil Zinc Plated General Purpose..